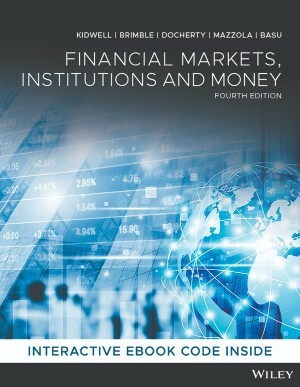 The fourth edition of Financial Markets, Institutions and Money (Kidwell et al.) 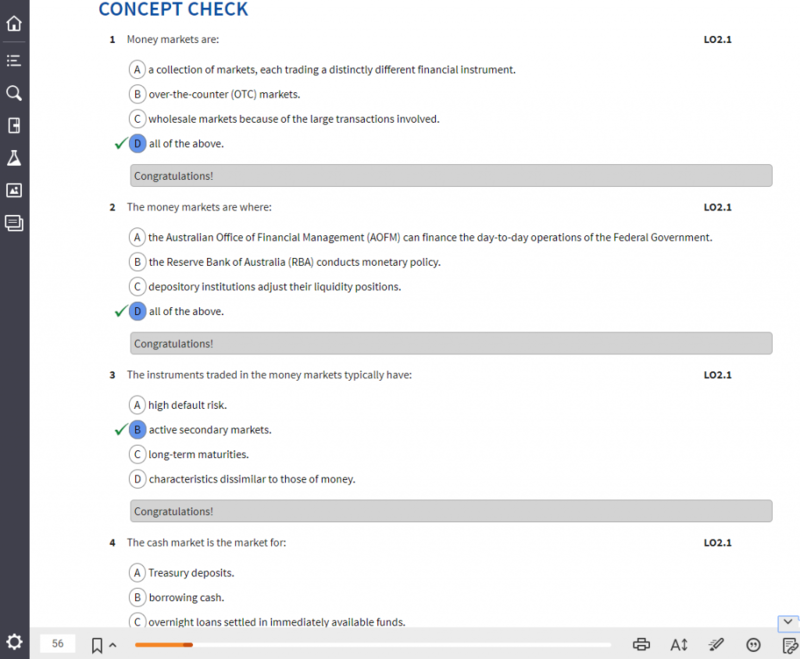 provides an overview of all the financial institutions, markets and money that make up the financial system in Australia. Key authorities such as the Reserve Bank of Australia and the Reserve Bank of New Zealand are also examined. Kidwell’s 4th ANZ edition has been thoroughly updated to present the most current view of the financial environments in Australia and New Zealand. A web chapter on the Reserve Bank of New Zealand is available to New Zealand adopters on request. 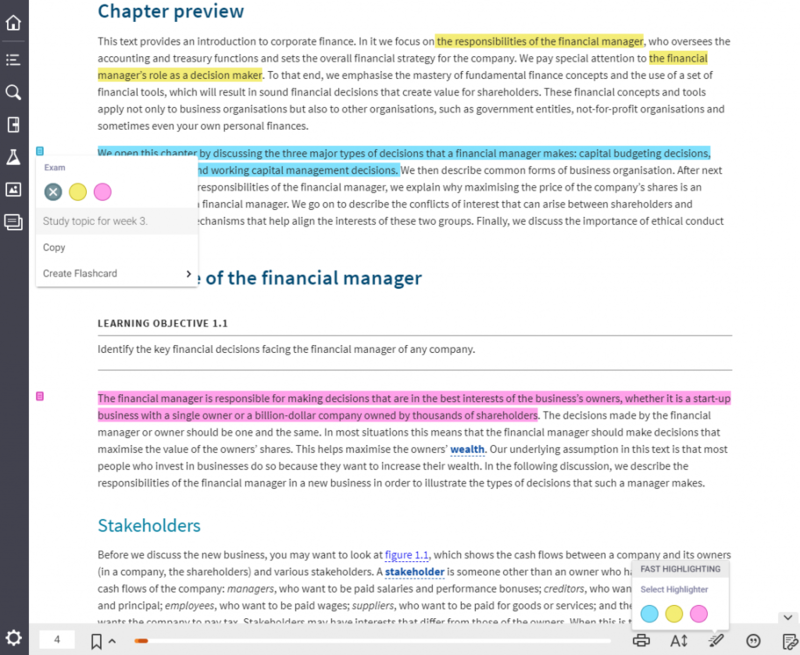 In the eBook version of Kidwell’s 4th edition, each chapter features an interactive revision quiz and feedback at the point-of-learning. Economics in the Griffith Business School. He has a PhD on capital markets and has active research interests in financial markets, sustainable finance, personal finance and finance education, with publications in various national and international journals including Accounting and Finance, Corporate Governance: An International Perspective, Housing Theory and Society, Griffith Law Review, Australian Tax Forum and Higher Education Research and Development. Dr Brimble is a Commonwealth Office for Learning and Teaching National Fellow. Mark is the recipient of numerous teaching and learning grants, citations and awards, including leading the team that won the 2010 Business and Higher Education Round Table award for the best higher education and training collaboration, and achieved platinum in two categories in the 2017 Learn X Awards. Mark was awarded Australian Teaching and Learning Council Citations in 2011 and 2016, and an Australian Award for Teaching Excellence in 2016. Dr Brimble is a CPA, a Fellow of the FINSIA, and a member of the Financial Planning Association of Australia and the Australian Institute of Company Directors. Mark was a foundation member of the Financial Planning Education Council and Chair from 2012–2017. He was also the Founding Co-Chair of the Financial Planning Academics Forum and Co-Founding Editor of the Financial Planning Research Journal as well as a foundation director of the Financial Adviser Standards and Ethics Authority. Paul is a Senior Lecturer in Finance who joined Monash University in July 2017 after ten years at the University of Newcastle. His main research interest is in empirical asset pricing, where he has published several peer-reviewed articles and supervised seven PhDs and seven Honours students to completion. Paul’s teaching tends to align with this research interest. He has won several awards for teaching, including the Newcastle University Postgraduate Students’ Association (NUPSA) award for ‘Teacher of the Year’ and a Vice-Chancellor’s citation for teaching excellence at the University of Newcastle. Paul remains engaged with external stakeholders while undertaking his academic responsibilities. He has undertaken consultancy projects for a number of organisations in the funds management industry and is a regular media contributor. Paul Mazzola is a Lecturer in Banking and Finance in the Faculty of Business at the University of Wollongong. Before he joined the university, Paul had a career in banking, spanning over 20 years covering the Australian, European and Asia–Pacific markets holding senior executive and regional management positions. Paul’s experience has involved corporate and investment banking, project and international trade finance, investment management and mergers and acquisitions. His research interests include banking and financial markets, risk management, valuation methodologies and banking history. Paul has presented at domestic and international conferences and seminars and has extensive experience in teaching and learning leadership roles with numerous teaching awards, including the ‘Lecture of the Year’ award. Paul regularly contributes to a national radio program on money and finance and is frequently interviewed as an expert on banking by the media. In addition, Paul has consulted domestic and international organisations on strategy and organisational restructuring, has been a past State Chairman of the Turnaround Management Association of Australia and is a Fellow CPA and Senior Associate of FINSIA. Anup Basu is an Associate Professor of Finance at Queensland University of Technology (QUT). Prior to joining academia, he served in management positions with large banking and financial services organisations in India and the United States for more than eight years. Anup’s research has been published in several peer-reviewed journals of repute and covered by both national and international media. His work has been cited by the Cooper Review of Australian Superannuation System, Productivity Commission, Australian Securities and Investments Commission, United States Securities Exchange Commission (SEC), Organisation of Economic Co-operation and Development (OECD) among others, and has had significant influence on policy recommendations and regulatory changes. Anup also serves as an advisor to superannuation funds and corporations on investment management issues. Students can purchase their Financial Markets, Institutions and Money, 4th Edition (Kidwell et al.) from Wiley Direct.